I love winter photos. The stillness of the snow, the contrast as it sits on the trees….it’s magical. My favorite memory of the most iconic picturesque winter moment was when Zach wanted to go skiing at Sundance for his 12th birthday (I think it was 12). It’s at the end of November and we’d just had a major snow storm. As we were traveling up the canyon, the Heber Creeper–an old timey train–came puffing along through the snow-filled trees. It was the most beautiful serendipitous thing I’d ever seen . . . and I didn’t take a picture. It will be forever imbedded in my mind though. Then, of course, there was the whole moment of skiing up at Sundance that was completely gorgeous. And I did get pictures there. 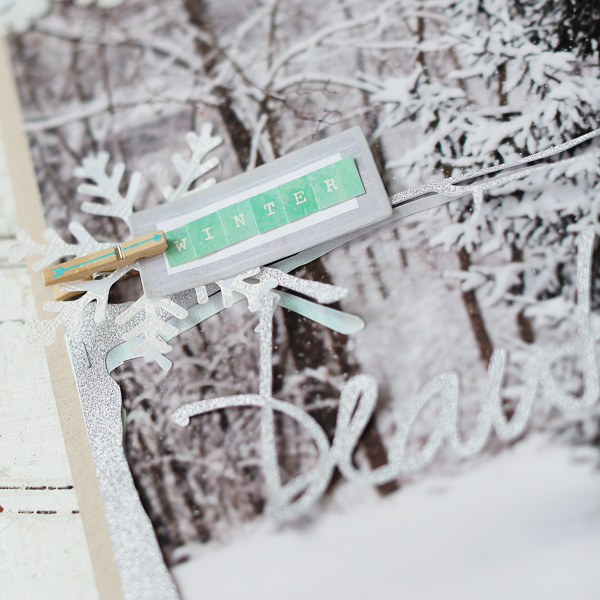 So when Naomi sent me her layout on capturing the beauty of winter, I was wowed. I loved the large-take-center-stage photo complemented with a little bit of accents. I wanted to keep this layout somewhat simple, since I really loved the large photos. 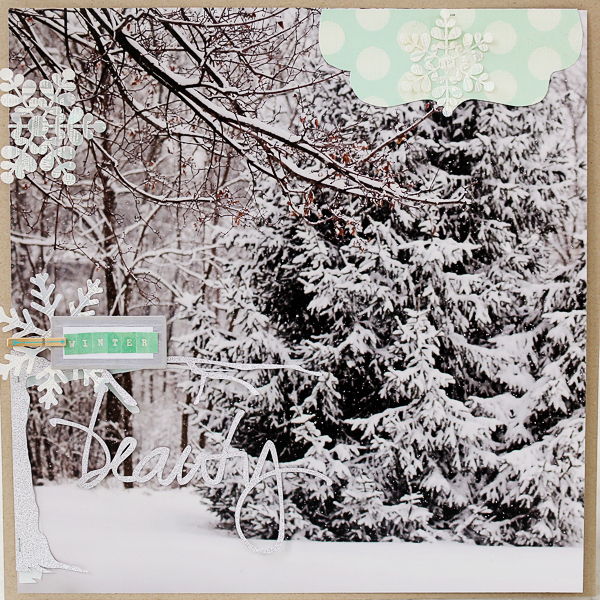 I knew some of the winter shapes would be good for layering on this layout! I decided to cut my branches and snowflakes out of silver “pow” glitter paper (It’s from American Crafts, and the cuts are just AMAZING) and vellum, for a translucent, snowy look. 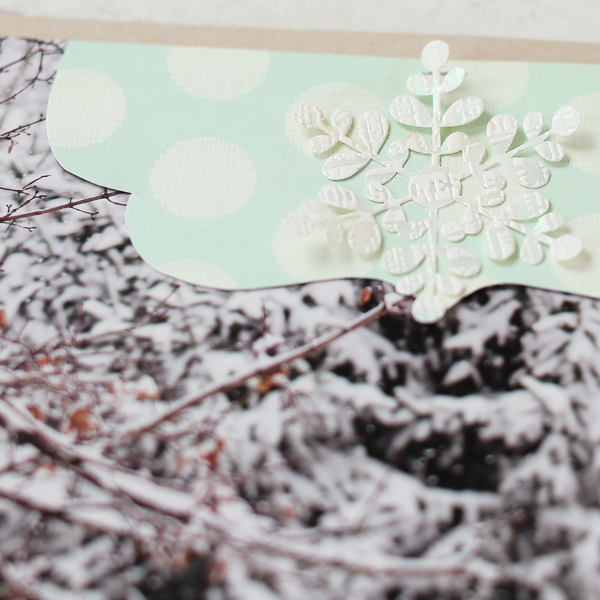 I liked the vellum snowflakes, but wanted to add more dimension, so I stamped over the snowflakes and embossed them with white embossing powder. I really liked the results! I also layered a vellum tree branch under my silver one for extra dimension there. I attached another stamped snowflake to my paperclip and the title word winter, and then cut the word “beauty” out of the silver paper as well.